​Did we forget something? Let us know! Cameron's Beach Campground camping reservations must be made by phone or email. You may fill out a reservation information request form to check availability. Please note that a reservation request does not guarantee a site or reservation, it is just an inquiry into availability. If done by email, you will receive a confirmation email if there is space for dates inquiring about and you will need to call with your credit card to hold your spot and if no space then you will receive an email stating there is no vacancy. Check-in is any time after 2pm. Please note that we do not have available parking for vehicles and camping units prior to 2 PM.Check-out time is 12 pm. Late checkouts are permitted for a fee of $10 until no later than 5pm dependant on availability. If you would like to stay later than 12pm, please come to the office prior to 11 AM to check site availability. Please be courteous and allow time for us to prepare for the next guests arriving on that site. can we change sites after arrival? Yes, but please check with the office for availability. Never move without getting proper authorization from the office. You will not be allowed to move off your current site until the new site is vacant and clean. 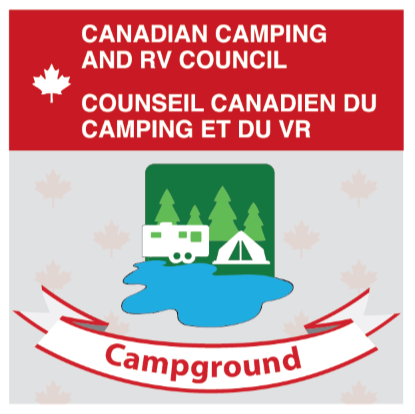 Please do not leave the campground until your current site has been vacated. do you accept personal checks as payment? Sorry, personal checks are not accepted at check-in. We apologize for this inconvenience. We accept Cash, Mastercard, Visa, Debit, E-transfers or Money Orders. ​information about cancellations or date change requests? Please see our rates page for details about our cancellation and date change policies. Please Note: Failure to check-in on the scheduled arrival date, without notice, will forfeit your site and you will be charged for one nights stay of 11 AM the following day. what if my guest wants to spend the night at my campsite? If a day visitor decides to stay overnight, their earlier payment will be applied to an overnight visitor fee. Overnight guests are welcome, any additional people not arriving with your party at check-in, and sleeping in your camping unit will be charged $5.00 per person per night ages 5 and up, they will need to leave their vehicle parked outside the gate. You are welcome to set up one additional tent on your site, there is a maximum of one camping unit and one tent per site. Please note that there is a 6 person maximum per site, including overnight visitors. can guests visit the campground for the day? Yes. All visitors entering Cameron's Beach must pay a fee. A Day Pass is valid from 8 AM to 10 PM. The price for visitors ages 5 and up is $2 per day. DOGS ARE NOT ALLOWED WITH VISITORS. Yes. There is FREE hospitality grade Wi-Fi available throughout the campground. There is a hot spot located at the Shelter. We have a maximum bandwith available so it may be spotty or slow. Absolutely!! All campsites are equipped with a campfire ring. Fire in and of itself is dangerous and must be kept under control and always tended to by an adult. It is prohibited to use any flammable liquid to start your fire. Fire-starters and firewood are available for purchase at the office until 10:30 PM. Do not add wood to the fire after 11 PM. NO out of area wood is permitted. Our by-law for the area is No campfires permitted during the hours of 10am to 6pm. Campfire must be put out before heading in for the night. Absolutely! Pets are allowed in RV’s and campers only. They are not allowed with visitors/overnight guests. Pets must be leashed at all times & NEVER left unattended, this includes in your trailer. They must also be under the supervision of a responsible person. Pets are not allowed at the beach area, there is a spot at the boat launch area where they can go in the water but cannot go beyond the dock. They must be cleaned up after immediately. Any aggressive behavior, barking, and general disruption will result in pet eviction.